CMRA Annual Convention (International Secondary Nonferrous Metals Conference and Exhibition) is a platform established in 2000 that devotes to serve the development of global recycling metals industry for 16 years, and concentrates on industrial policy exchange, trade cooperation, technology docking, and intelligence and capital importing. It promotes coordinated development of the industrial chain, and strives to create the most effective annual event for the global recycling metals industry. 2017 CMRA Annual Convention that hosted by China Nonferrous Metals Industry Association (CNIA), and organized by China Nonferrous Metals Industry Association Recycling Metal Branch (CMRA) is going to be held at Shangri-La Hotel in Ningbo from 7-9th November. 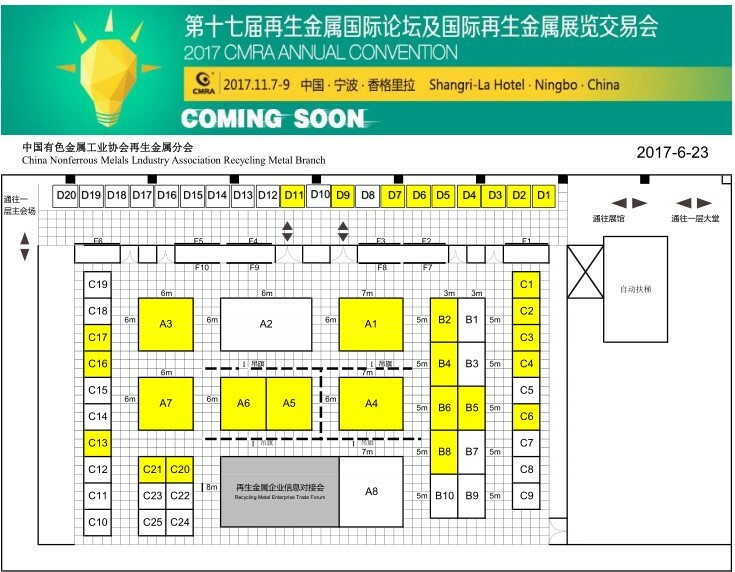 2017 CMRA Annual Convention will present global recycling metals industrial latest policy and development trend, new industrial opportunity, development of international market, capacity cooperation & opportunity under “one belt & one road”, development latest mode, and hot spot on industrial chain upstream and downstream. Through keynote reports, seminars, dialogue, exhibition, 2017 CMRA Annual Convention provides zero distance communication and display opportunity for policy makers, administrators, experts, whom can discuss the development issues, market trend and mode innovation etc. together. 2017 CMRA Annual Convention will keep inviting competent authorities like NDRC, MIIT, MEP, and GACC, etc., international industrial organizations like BIR, ISRI, and BMR, etc., elites and experts in domestic and foreign industry, scientific research institutions to discuss the industrial change and breakthrough on the industrial influence, capacity cooperation & opportunity under “one belt & one road”, import supervision policy, and environmental requirements etc. RegistrationTime：08:30-22:00, 7 Nov. Location：the first floor of Shangri-La HotelCMRA Welcome Reception (by invitation)Time：18:30-20:00 ,7 Nov. Breaking the MarketTime：14:00-17:00, 8 Nov. Innovation & ChangeTime: 14:00-17:00, 8 Nov.
Green DevelopmentTime: 09:00-12:00, 9 Nov. Note: To ensure the conference quality and protect participant’s rights, please send your photo as the following standards:–File type: jpg or jpeg–Aspect ratio: 4:3 (width:height ratio)–File size: greater than 2MB and less than 10MB.–Dimensions: minimum 900 pixels wide x 1200 pixels high – maximum 4500 pixels wide x 6000 pixels high.